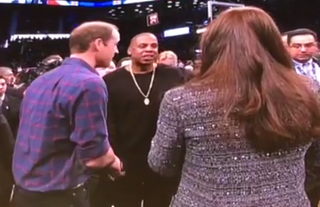 American royalty meets British royalty. What happens next? Do they claim our pop music as part of their own sovereign nation? Was this a treaty of some sort to give over control of Wales to Beyoncé so she can build Blue Ivy a dollhouse cottage there? WHAT DID THEY SAY TO EACH OTHER? I MUST KNOW.